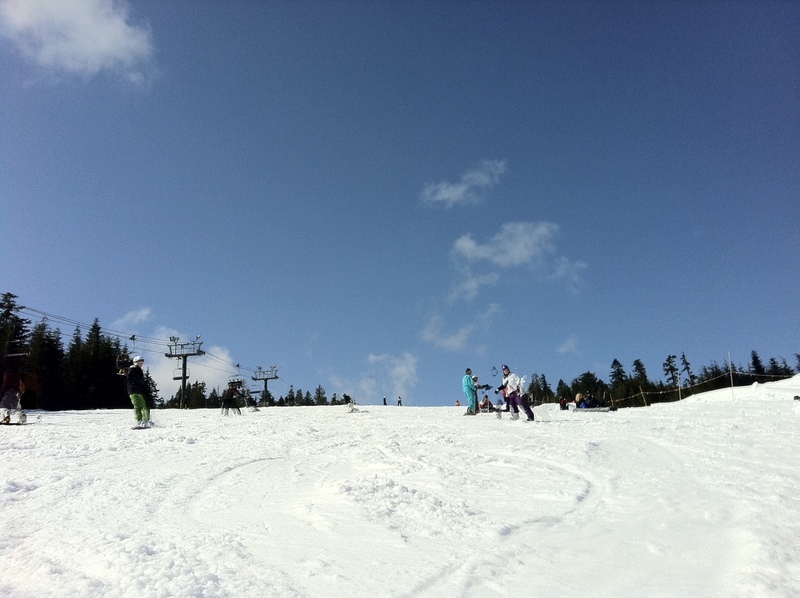 This weekend we headed up to Whistler. Exciting times, as while we had gone up there before to party, this was our first time on the slopes. Nicky was headed off for a full day of lessons. And I was to brave the slopes alone. Now, I like to board alone, just me and my music. Same way I like to swim and workout alone, I just don’t need the distraction and I like total focus. But I forgot that the local mountains aren’t the same as resort riding and sometimes you like a buddy to throw yourself down beside and take in the views. 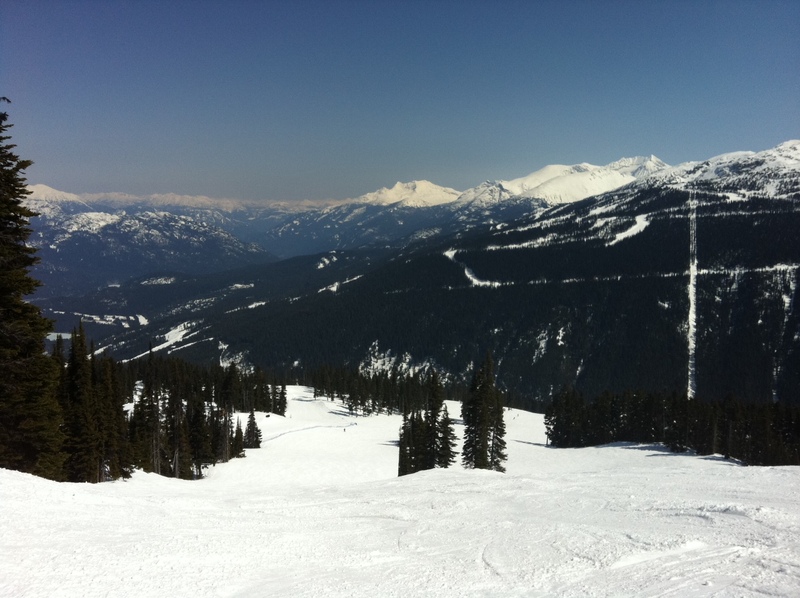 And what views there are in Whistler. It truly lives up to its reputation and is incredible. My first run was a mess, getting used to the rental board, I fell over and was hating it. Sometimes it can take me a while to get back into the flow, which is a flaw of my riding style. I don’t know if it’s lack of confidence or what. Definitely something to improve upon. Lunch experienced a brief moment of weakness, thinking I’d pack it in and head back to the hotel hotub. We had gotten up at 5am to make the 6.30 bus, boarding was the last thing I wanted to do. But I regrouped and decided to discover the quieter runs, everybody seemed to flow down the same two main runs by the gondola. I like my space. 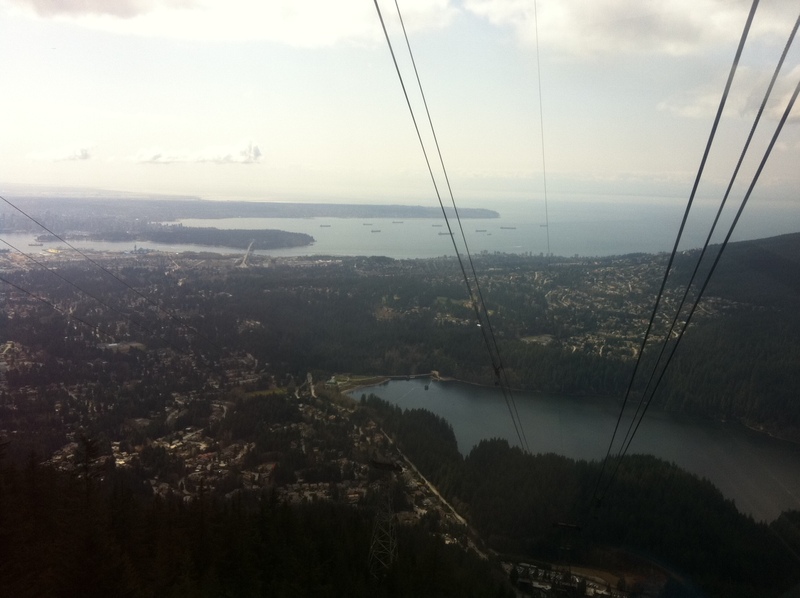 Some epic views and I serendipitously took the Harmony chairlift up to the Symphony area. Wo-ow. This was like something from a James Bond movie, a desert of snow and nothingness. Considering how packed the snow was down by the gondola, this was such a treat. There was only a handful of people on these runs at any time and it felt like owning your own mountain. I took a video to show off how empty it really was. I’ve always wanted to go glacier boarding and this is like a taster of what that experience might be like. Yes, it’s shaky, consider that my auteur stylings. Did I mention how incredible the weather was, the sun was high in the sky and people were slathering on suncream. I cruised down the mountain and while I took some hard falls, had an epic time. I used to joke that ‘all my snowboarding injuries are emotional’. Pride, fear, frustration, the injuries you can’t see. But snowboarding can be an abusive lover. 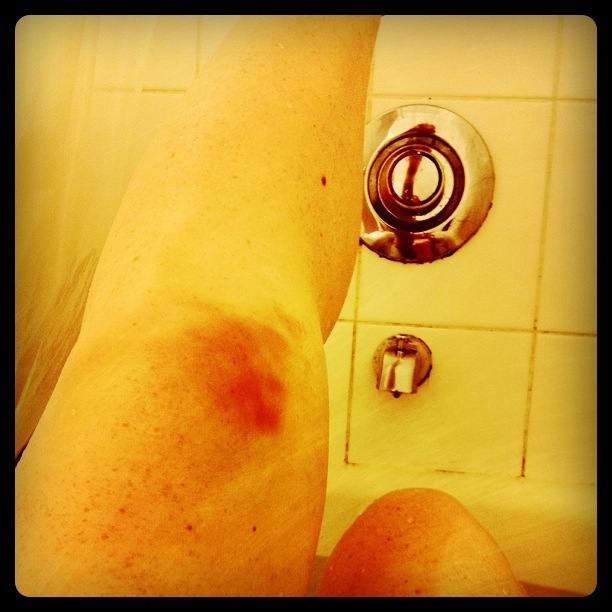 Check out that bruise, what a treat. Back pain and a bit of snowboarding whiplash too. However, nothing hurt as much as tonight’s Canucks loss. Bitter. I’ve jumped on the Instagram bandwagon, can’t help messing about with those filters. 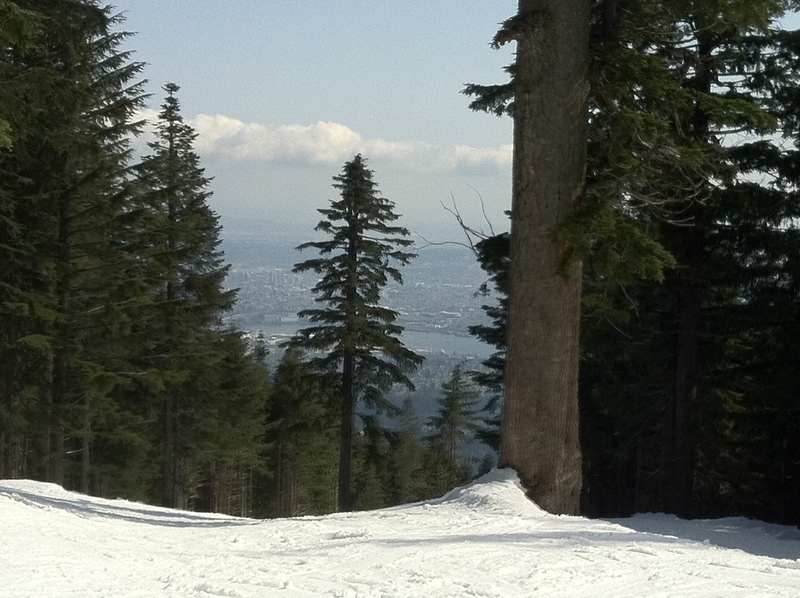 Surely the most wonderful thing about living in Vancouver is the proximity to the mountains and fresh powder? Admittedly it takes me an hour to get there by three kinds of public transport, but if you have your own car, twenty minutes. 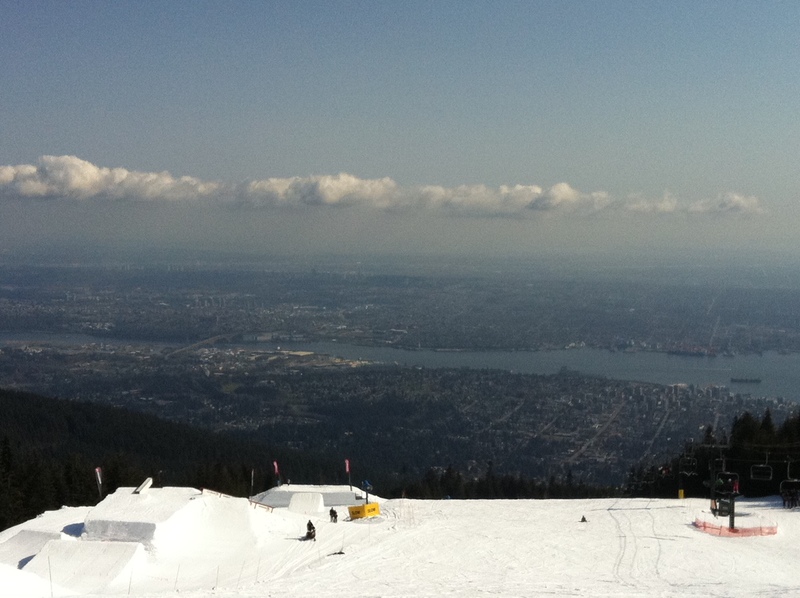 And yet, so many Vancouverites don’t do winter sports. Mentallers. Until you’ve stood at the top of the mountain looking down on the city glittering beneath you, you haven’t lived and loved the beauty of this place. And night boarding! God, night boarding is incredible. The whole city is lit up and you are in darkness whizzing down towards it. From the slopes, a metropolis awaits. 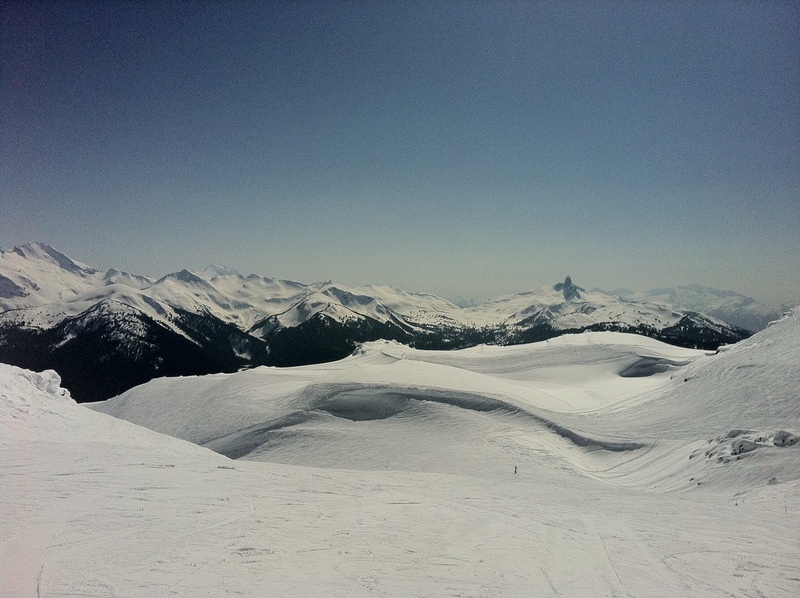 As much as apres ski is awesome in Europe, you do not get these views. What is great about North American boarding is that it can never be as crowded as the European slopes. It’s often been me alone on a deserted run in Grouse, nothing but the skies above me and the snow beneath. Hello, peace. Even today, on a beautifully sunny bank holiday when the slopes were packed, I hit a quiet run and I was totally alone. The city giving me a sneaky peek between the trees. One of the only times when I think about no one and nothing is on these slopes. 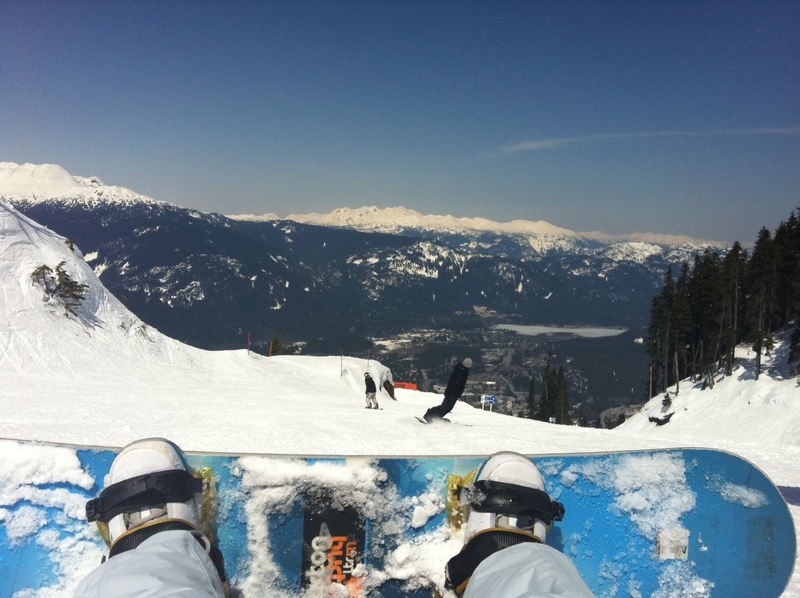 It’s just me, my iPod (epic boarding tunes) and my snowboard. You just feel your body twisting and turning and the board in tune moving beneath you. Sometimes you hit a smooth stretch and it’s unbelievable how fast and fluid you are going. Other times, you hit the snow hard and have to bounce back up. Though my photos deny it, it was beautiful weather up there today.